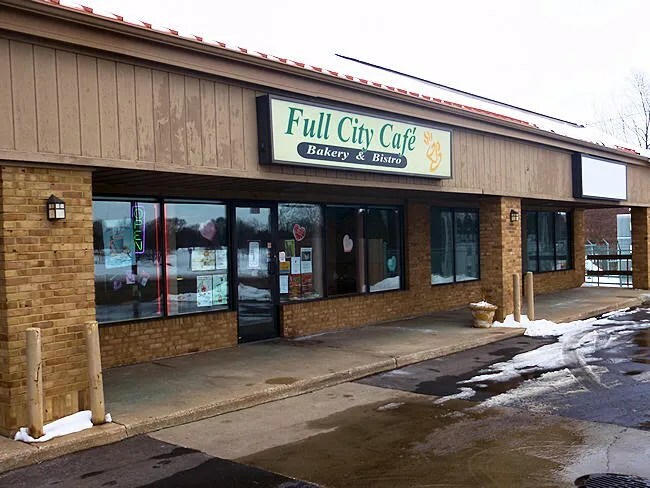 Back in November, J and I got up for breakfast and headed to Full City Cafe in Portage. We loved the place. Great food. Great atmosphere. Didn’t have one complaint about the meal. Since then, we’ve wanted to try their lunch. If breakfast was that good, we were excited to see what they had to offer in the way of sandwiches. We chose to go to the Kalamazoo location on Parkview Drive at Oakland. This spot is much smaller than the Portage location, but it still has an intimate, cozy feel. When you enter the door, you come right to the coffee counter. There are tables spread around the rest of the space. A lady working the coffee counter told us to grab a seat anywhere if we coming in for lunch, so we took a two-top against the wall on the right side of the space. It was just after the lunch rush, so most people were finishing up, but even at 1:30, there were still people coming in with their laptops and newspapers to enjoy a meal. J wanted an iced coffee drink, but really couldn’t decide what she wanted. 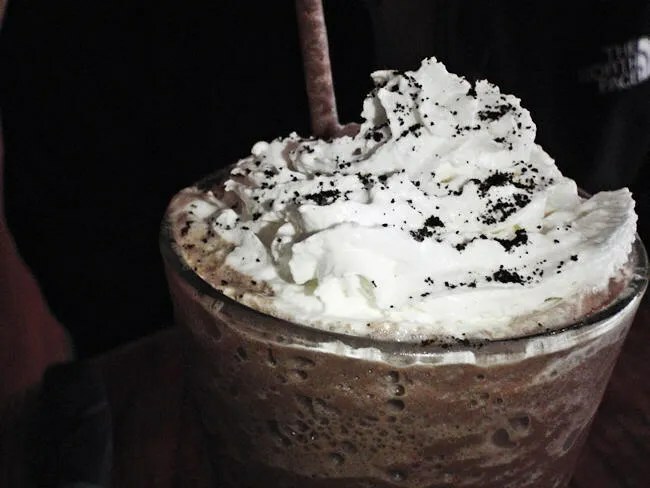 She found a drink on the menu called a Peppermint Patty. She loves peppermint and it was an iced drink, so that’s what she ordered. I just got a Coke. By the time our server got back, we had decided on sandwiches. There wasn’t much on the menu that jumped out at me because there are no burgers. What I did find was the Texas Pulled Pork which is one of their speciality items. 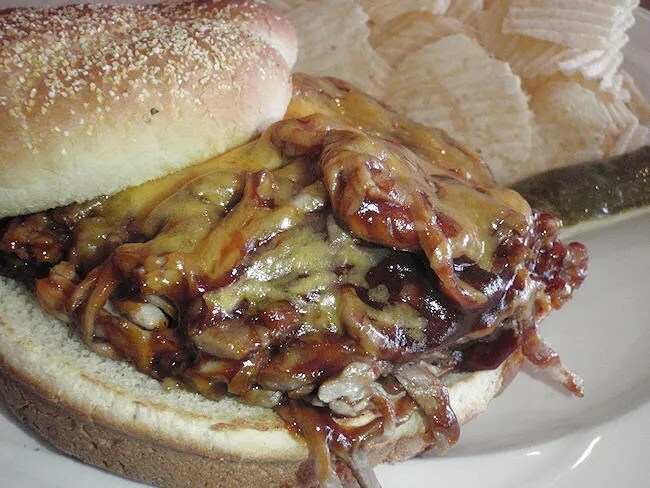 The sandwich comes with tender, roasted pulled pork that is swimming in a tangy, sweet BBQ sauce. It’s topped with cheddar cheese and red onions. I asked to keep the onions off. It was actually quite delicious. I’m always nervous about ordering pulled pork at a restaurant that doesn’t specialize in BBQ because it’s usually more of a pureed pork. This was not the case. The meat was fork pulled and there were still big chunks of meat. The cheese was interesting and not something I’ve had on pulled pork very often. It sort of melted in with the BBQ sauce. The sandwich came with chips which were probably out of a bag, but a nice complement to the meal. J had a hard time deciding. There was plenty on the menu that sounded good to me and she was deciding right up until she placed the order. She even let me order first so she could have a few more seconds to decide. She ultimately chose the Oven Baked Cheese. This sandwich is a grown up version of a grilled cheese. 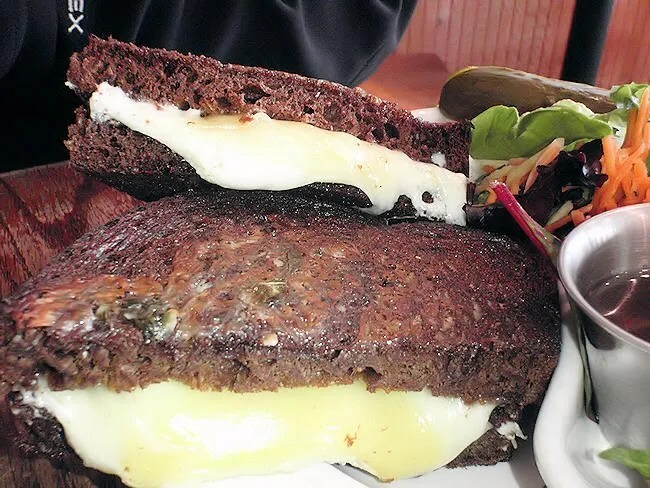 It was served on pumpernickel bread with Gorgonzola, swiss, and provolone cheese with a basil pesto. The sandwich usually comes with red onion and tomato, but she asked to leave them off. She was a huge fan of this sandwich. She ate about 3/4 of it before cutting off the last half of a half to give to me. The Gorgonzola really gave the sandwich a tang and the combination of the three cheese made a gooey, delicious mess. Instead of chips, she got a side salad with a cherry port dressing. She loved the dressing. She tore through the side salad like it was the main dish. I’m not sure I’ve ever seen her that excited about a simple salad. 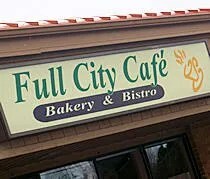 Full City Cafe lived up to our lunch expectations. The bill was a little high at $25, but you are given high quality ingredients. I still have a feeling I’m always going to think of Full City as a great breakfast spot first, but they do a solid lunch as well. I dont’ think you’re going to be disappointed no matter what time of the day you stop in.